Review Context: I am a huge Nintendo fan and the Mario Kart series always hits close to home. I can still remember unwrapping Mario Kart 64 on my ninth birthday and my first experience with the Mario Kart franchise. Since Mario Kart 64 I have not missed a single release in the franchise. We all have a franchise or game that takes us back to our childhood, Mario Kart and Smash Brothers are mine. Mario Kart 8 is finally here! Wii U owners rejoice that there is another first party Nintendo title available. The new installment in the 22-year-old franchise comes with some new changes. But do the changes work or do they take away from the series? From the moment you fire Mario Kart 8 up you can tell that you are in for a good time. The menus are simple as always and easy to navigate, but just the music and feel of the game got me so excited to dive right in. The gameplay is what we all know and love. The 16 new courses for 8 are all very fun and all very beautiful with my personal favorite being Electrodome. All of the courses seem to accommodate the new Anit-Grav racing very well. After enough time in the game I forgot that the karts were even flipping upside down because of how seamlessly it happened in game. The old 16 tracks have returned with a vengeance. 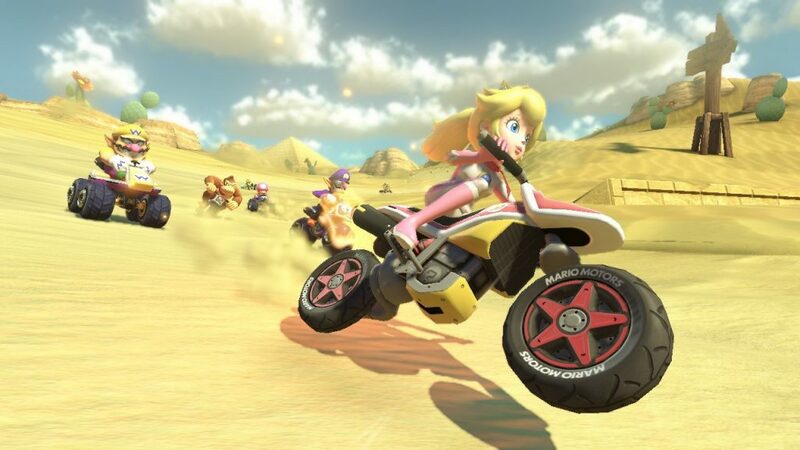 I will admit I was upset that tracks like Sherbet Land and Dry Dry Desert made a comeback when there were so many better courses in Mario Kart: Double Dash!!. But with the changes that have been made to the tracks I can say that they were good choices to bring back. The feature that has seemed to make its way over from Mario Kart 7 is kart customization. The strategy of building your kart from wheels, body, and glider is something that I like and hope continues on in the franchise. One of the few issues I have with the game is the roster of characters we are given to race with. In Mario Kart 8 we get the addition of all of the Koopalings, which is a great addition. But we also see Baby Peach, Baby Rosalina, and Pink Gold Peach added to the game. So we now have 3 forms of Mario (Mario, Baby Mario, and Metal Mario) and 3 forms of Peach. I think instead of more baby and metal characters that Nintendo should have put some different characters. Where is Bowser Jr., Dry Bones, and Petey Piranha? It feels as if the roster has been watered down with different versions of characters. There is no way around it, Mario Kart 8 is a gorgeous game and really shows off what the Wii U is capable of. You can really see how amazing the game looks on tracks that have a lot going on in the background, an example being the new Bowser’s Castle. The game runs at a very smooth 60 frames per second and manages to keep the frame rate the same for 2 player. For 3 &4 player the frame rate drops down to 30 frames per second, but it still plays perfectly fine and looks great. The addition of Mario Kart TV really helps show of the graphics of the game. It was not until I was cutting a replay to upload that I noticed how far in detail Nintendo went on the character models. While driving around you can see Mario’s mustache bouncing with all the bumps and moving from the breeze. Mario Kart is always a game that is a lot more fun when playing with others. 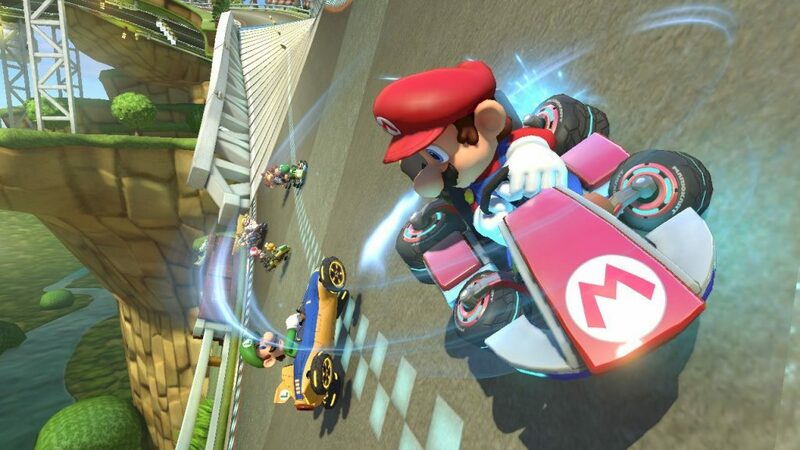 Nintendo has placed online multiplayer in Mario Kart 8 and it works really well. You can race with up to 12 people from all over the world, but I still feel that Nintendo misses the mark in online multiplayer with there being no voice chat in the game. I believe that the online would be a lot more fun if you could make private rooms with friends and voice chat while you race. The online racing though once in game runs flawlessly. On very rare occasions have I had a communication error and been disconnected from the game mid race. You can race and play battle mode online. Which brings me to battle mode and the travesty it has become. Battle mode was always my favorite mode, but I want nothing to do with battle mode in Mario Kart 8. Battle mode has always circled around the arenas and how you would set up your attack on your friends. Not anymore… It seems Nintendo is done with such great arenas (RIP Block Fort). Now Nintendo has placed full courses in and not all over the full courses, just 8 of them. It is now like you are almost running an endless race until everyone loses all of their balloons. I can only hope now that Nintendo has the ability to give online updates that they provide DLC with some actual arenas in the game and give us back battle mode. In the end Mario Kart 8 is an amazing game and a must own! I have been playing it since launch and still have a blast racing online racing against people. I feel like a little kid again firing up my Nintendo 64 and challenging anyone I could to race. 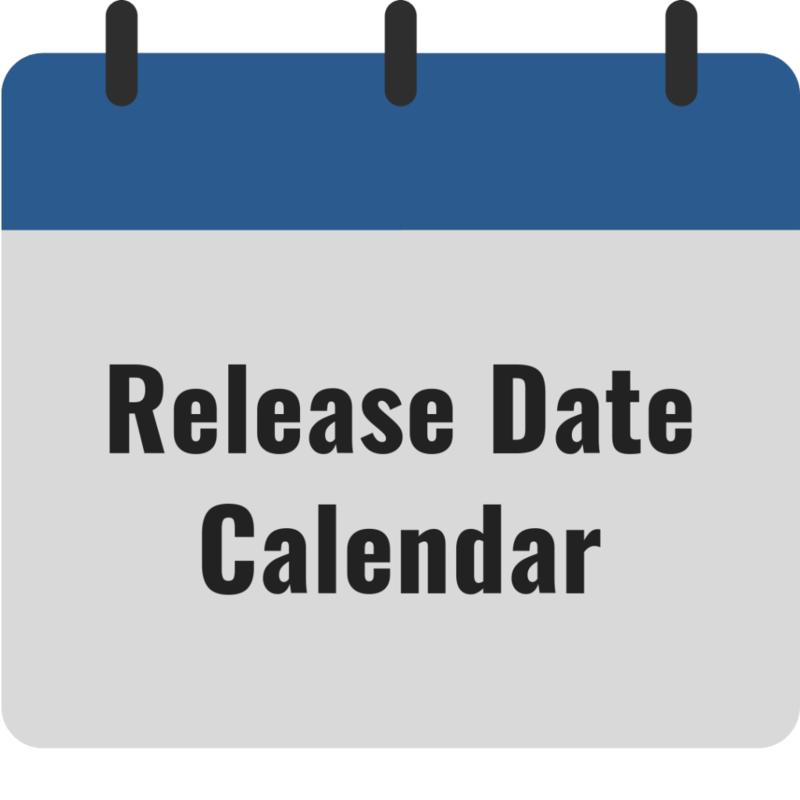 If you do not have a Wii U, now is the time to get one! With Mario Kart 8 being so fun and Super Smash Brothers around the corner this holiday season things are looking up for the Wii U.